Looking back across my adult life, I can’t think of a time that I’ve been to my mom and stepdad’s house and there hasn’t been the option of good Scotch only a request away. It’s definitely Ken’s favorite sipping beverage and he always has a small selection of really good bottles on hand to share. And, share he does. Seemed only appropriate that when I asked for a bottle of Scotch a few Christmases back it should be Ken that picked it out for me. His choice was a bottle of Glenfiddich 12 and it’s a bottle I cherish and enjoy still. Earlier this month I got an email announcing a special, limited bottling of Glenfiddich, the Cask of Dreams. The idea really struck a chord for me and I knew I wanted to sample it, if at all possible. And, luckily, I did. 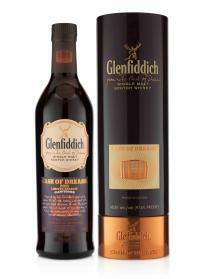 The Cask of Dreams is a blend of Glenfiddich whiskies the youngest of which is 14 years old. What differentiates this blend though is that it was then placed in a very special set of 11 new American oak barrels and finished for 3 months. What made these barrels truly special is their story. 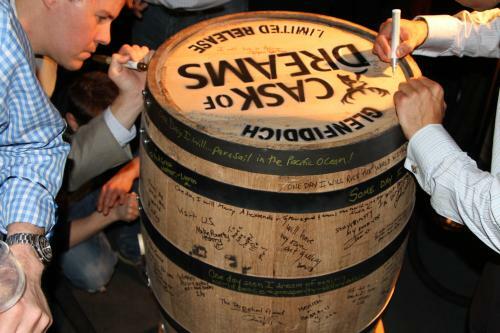 The Glenfiddich team took the barrels across the US and asked people to commit their dreams and signatures to the barrels themselves. When the barrels returned to Scotland for filling their were thousands of signatures and dreams written upon them. The resulting whiskey is reddish caramel color. The nose has touches of vanilla, but the real star is aromas of dried stone fruits, specifically cherries and apricots which reminded me strongly of fruitcake. I know that’s not a good thing in a lot of minds, but trust me, it’s a really good thing here. The flavor follows the aroma to a tee with this one. Subtle sweetness, fruitcake and warmth. With a tiny touch of water I found the flavor profile smoothed even further with more spice notes coming through. This whisky is definitely near the top of my list. The combination of fruit and spice notes with a touch of sweetness really makes for a fantastic dram. Seems fitting that Glenfiddich would choose this whisky to represent their 125th anniversary. There are certainly a lot of dreams that have gone into the Glenfiddich story leading to this point. Well done. There will be 3,500 bottles released in total starting in February of 2012 for a reasonable price of $99 per bottle. You definitely could do much worse than picking up a bottle for yourself or a fellow Scotch lover. I loved it enough, I bought myself a bottle for my collection. You can bet I’ll be sharing it with Ken.